Good hydration is an important skill for cycling. It is easier to become de-hydrated and (less frequently) over-hydrated. When I started cycling, I had very little knowledge of electrolytes and rarely took any. I rarely cramp, but feel moderate electrolyte use is a much better way of keeping well hydrated. I was partly inspired to write this after recent episode of diarrhoea where electrolyte tablets came in handy. Though it has made me look for some without sweeteners. With body around 60% water, maintaining hydration is important. Loss of water and electrolytes can hold back performance and even lead to cramping and other problems. Water and drinks manufactures often emphasise studies which show small water loss can lead to big decline in performance. Whilst there are different opinions about actual extent of performance loss, avoiding excess dehydration is a must for any athlete. It takes quite a bit of preparation and trial and error through practise. Also, if you drink just water (hypotonic) it can reduce your thirst because, it will lead to lower salt levels and leave a feeling of bloatedness. The body needs more than water. It also needs key electrolytes to maintain the right balance of cells and. Can prevents cramps. Though cramps can be caused by other factors too. When we sweat, we lose electrolytes. The main salts lost are sodium and chloride, [electrolytes lost in low concentrations include potassium, magnesium and calcium]. In very heavy sweating, we can even see it crystallise – which is all the salt we are losing. This needs to be replacing or our muscles will start to cramp – giving an indication the body can’t cope with sweat loss. Although, this is often a rough guide to hydration levels, it is worth bearing in mind it is not without exceptions. – Some supplements like creatine, beetroot can make urine darker. – Even light coloured urine can be a sign of dehydration. For example, if the kidney is under-pressure, e.g. cold, the kidney can excrete more water in the urine. Giving a light coloured urine, but you can be under-hydrated. Lacking in electrolyte. If your body is short of key electrolytes, and you drink pure water, the body can’t absorb the water because it would dilute the electrolyte balance in cells, therefore, the extra water just gets excreted. But, you are still de-hydrated. What you need is water with some electrolyte solution to make it easier to re-hydrate. Hyponatremia is defined as a decrease in sodium concentration in the blood. This can occur due to sweating and drinking just water without salt replacement. During hot conditions, it is easy to get dehydrated performing in long events like a 50 mile, but especially 100 mile race. If the temperature increases from 15 degrees to 25 degrees, the change in water consumption can be quite marked. I’ve finished a few 100 miles with mild signs of dehydration, dark coloured urine and a bit of a headache, which requires careful rehydration. Because of these chastening experiences, I’ve gone to the other extreme and over-hydrated before 100 miles – if it was colder, I’ve ended up having to stop in race to empty excess water. It is important not to really over do it. Keeping fairly normal drinking and eating habits is a good rule of thumb. When hydrating before a race, it is good to have a some amount of electrolytes. This can help the water be absorbed rather than excreted. I try hard to avoid getting cold or overly hot. For me, the bigger issue is the cold. In middle of summer, I can take a big winter coat so I don’t get cold at 6am waiting for start. This is because, the cold makes my kidneys excrete extra water, which is counter-productive for a four hour race and also prevents proper hydration. Bananas are a good source of Potassium. Though you can overdose on Potassium; one or two bananas is good limit, if combined with other electrolytes. 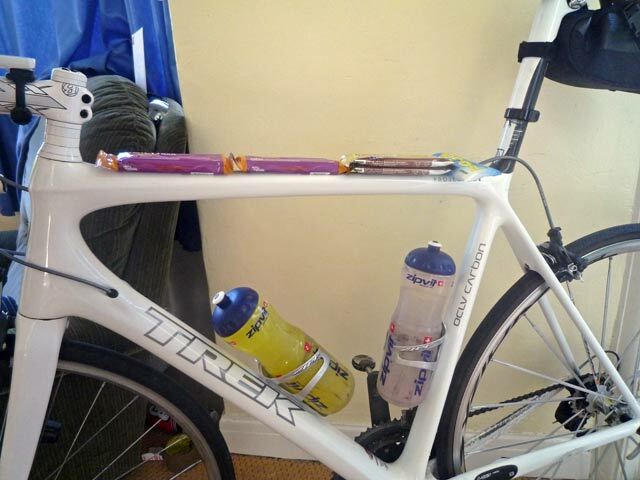 However, if riding in the heat, you will need to supplement from usual diet. Milk – sodium, potassium, calcium and magnesium. San Pellegrino, low sodium, but source of potassium, calcium and magnesium, choloride and bicarbonate. I like taste of this, when cold, though it can have a mild laxative effect. It depends on heat, in cold, you can get away without any extra. Though, these days, I will take some, even if it is one bottle with a half a sample. It depends on body type. Some are heavier sweaters. I’m relatively thin and don’t sweat so much. It is important to choose electrolyte with all main electrolytes. Check energy powder. Some varieties include electrolytes, some don’t. I bought some SIS energy powder, but it has no electrolyte within mix. Electrolyte tablets are so expensive, when there is no good reason. It’s hard to find any without artificial sweetener in. I bought some Torq Electrolyte powder from a local shop, but can’t find it online.